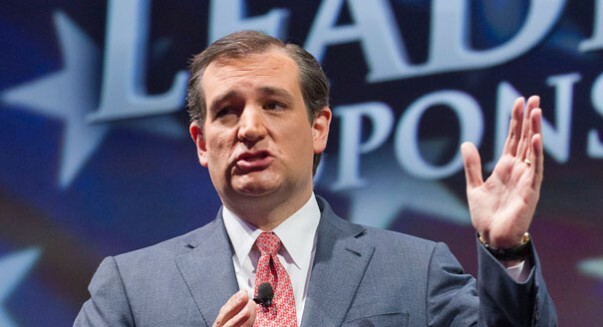 What the heck did Ted Cruz eat off his lip on live TV? A bizarre moment at the most recent Republican debate has the Internet buzzing. The Republican debates have been anything but ordinary, so it should be perhaps no surprise that people are talking about a moment when Ted Cruz appeared to eat something off his lip. The Texas senator was in the middle of talking about Donald Trump supporters when a small object appeared and then disappeared from his lip. It was about 25 minutes into the debate, which took place Thursday night in Detroit. Social media was soon awash in theories about what the small object could be, with many speculating that Cruz had eaten a booger on live TV. Others suggested that perhaps it was a tic-tac, or a piece of gum. Booger was the most popular theory, not surprisingly, and gifs of the drama unfolding in his mouth while he was speaking were passed around Twitter, Facebook, and elsewhere. So far, no one has gotten comment from the Cruz campaign about what the mystery object is — although most people probably don’t want to know. Cruz is the junior United States Senator from Texas. Cruz took a Senate seat vacated by Republican Kay Bailey Hutchison in 2012, defeating former state Represetnative Paul Sadler in the general election, winning by a comfortable margin. He was the first Hispanic American to represent the state of Texas as a U.S. senator. His campaign for the Republican presidential nomination began in March 2015, and he was the first to openly announce his candidacy. He is one of the three frontrunners for the GOP presidential bid, along with Marco Rubio and Donald Trump, although Trump is the clear frontrunner among all of them.